Tigers are unreal. I don’t normally post anything like this or watch it. But trying to find videos for WOS weekly has me looking past fishing adventures. The first ambush 27 seconds into the video is amazing. The way the big cat comes out of short green grass and attempts to reach the guy on top of the elephant is simply awesome. This guy is lucky to escape with his life. I do not hunt anything I don’t eat, and I would never hunt something so rare either. However, it looks like this animal was a problem cat. Judging by the video, they are in an agriculture area and the tiger had probably already attacked a human. Fortunately these sorts of incidents are on the decline. India has had its share of tiger/human interactions over the years as human populations have exploded and tiger habitat has diminished. Its heartbreaking really. But I imagine if a tiger were killing people in your neighborhood, where your children played, something would have to be done. In this country we try to re-locate wildlife, like bears for instance, when they become dangerous. But there are times when the bears injure or kill, or keep coming back to the same populated areas. This is most unfortunate, and I don’t claim to know the answer to the problem. 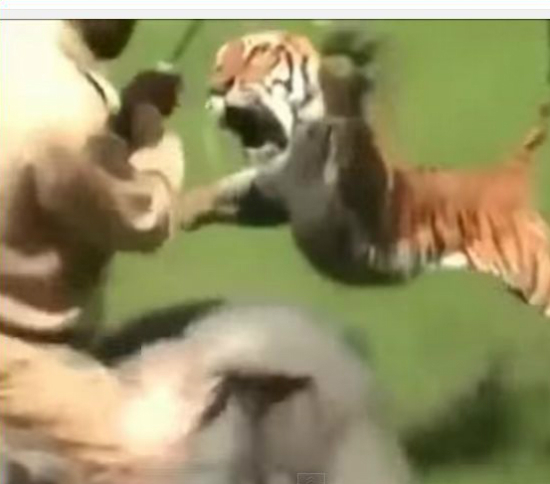 I posted and wrote about the video because the raw power of this tiger is something to behold. Nothing more, nothing less. The second tiger attack on the video is not as impressive, but likely was deadly. Viewer discretion is advised. Click the link below to read the story and see the video at Wide Open Spaces. аbout thiѕ. ӏ will forward tҺis wгite-up to him. Fairly certain hе will have a gοod read.